Contemporary Asian cuisine served in a relaxed setting inside the South Point Hotel, Casino & Spa. : Zenshin is Japanese for progression, or moving forward. With chef Terence Fong (known for his Island Sushi & Hawaiian Grill restaurants) at the helm, this contemporary Asian restaurant is moving in the right direction. Located just off of the casino, the dining room is tastefully set with comfortable booths and tables, wood flooring, warm hues of dark brown and walls composed of a mosaic of bricks. 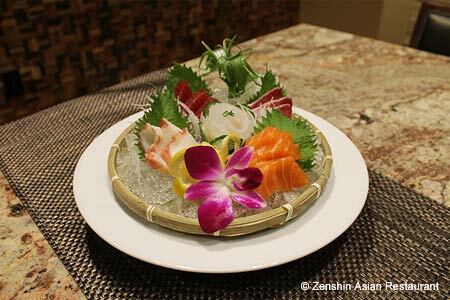 The centerpiece is the sushi bar, where chefs prepare a variety of sashimi, nigiri and sushi rolls, such as the "8-second bull ride," made with snow crab, avocado and tempura asparagus topped with seared Wagyu, sesame miso and a truffle essence. Begin with the addictive tempura eggplant fries with nori and garlic-miso dipping sauce, or the miso-glazed pork belly with yuzu-lime vinaigrette. For an entrée, we recommend the miso-marinated black cod with baby bok choy and ginger-soy vinaigrette. Complementing the Asian fare is an assortment of Japanese craft beer (such as Yo-Ho Brewing Aooni India Pale Ale), saké (for instance, Horin “Good Fortune” Daiginjo) and a selection of Japanese whiskey (like Suntory Yamazaki 18-year single malt). End with one of the several dessert options, such as yuzu-orange semifreddo with toasted almonds and lemon honey au poivre.